When I was a little girl, online shopping didn’t even exist yet…but I remember looking through my mom’s catalogs that arrived in the mail each month. I would flip through the pages and mark the ones that I liked best (even though they were women’s sizes and I was only 7 or 8 at the time). I just loved imagining what it would be like to dress up in all those fabulous things. Spiegel was one of the few catalogs that I actually remember my mom ordering clothes from, so I’m a little sentimental about the brand – which is why I was thrilled when they asked me to style something from their spring line! It was really hard to choose because there are so many great pieces for the season…most of which are on sale right now! But, this dress immediately caught my eye thanks to the fun color + slightly mod shape. And when I put it on, I was amazed by the couture quality for such a great price. I’m also seriously obsessed with these perforated pumps & this amazing leather jacket they sent me…I almost wish it was cold again so I could wear it! Since my blogging bff and I chose the same dress (without knowing it), we decided to link up and show “west coast vs. east coast” style! You can see how Jenn wore hers here. And the best news of all is that Spiegel is offering an exclusive discount code for PPF readers! Just enter “Spiegel2013” at checkout to receive 20% off your purchase. You always look so pretty and stylish!! I love that necklace! I've been looking around for something similar that adds a pop of colour to an outfit – great pick! You look stunning on that dress! It perfectly matches your skin tone too. It's my first time to read your blog and I'm instantly hooked! I love the vintage vibe of this dress. The clutch & necklaces are the perfect touch! Lovely outfit! And that necklace…beautiful! I love this dress! The colors are so pretty and it does look quite mod! I remember reading my mom's Speigel too!! Haha! This is a great dress you picked, I LOVE the color! What a beautiful dress on you… the color and the style. I hope you wear it for Mother's Day. I think it will be perfect. Such a pretty dress! That is so funny that you guys picked the same dress. I love the accessories that you picked to go with it. I'll be sure to check out her blog too. this dress is SO amazing on you! Love the slight striped detailing throughout and the luxe-looking fabric. That necklace is an amazing complement. I really love this dress and your necklace!! So pretty! The shape of that dress is perfect & I love the contrast of textures! Such a great mod look. 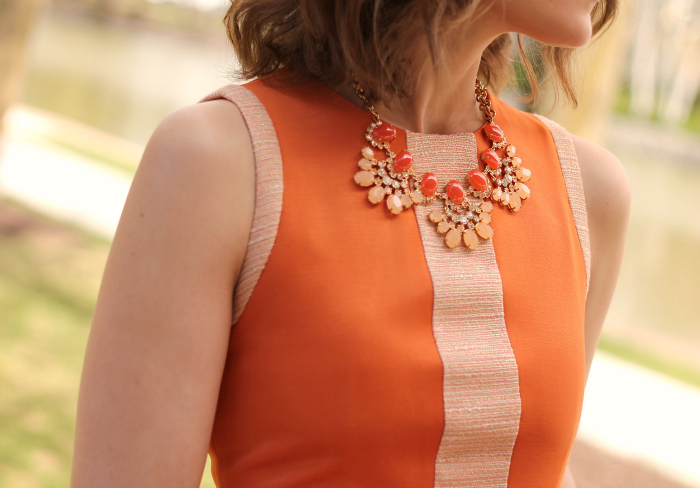 Love the color and the necklace is the perfect accessory! Too funny! I remember Spiegel too and to be honest with you I didn't even realize they were around anymore. This look is absolutely perfect. That dress is gorgeous and all the accessories are amazing! I always loved flipping through catalogs when I was little too! Great dress, I love the necklace you paired it with. this is absolutely gorgeous! great pick! Awwww….you look GORGEOUS!!!! I LOVE LOVE LOVE the new shorter do on you. And of course you rocked this dress….I knew you would! BTW, how did I miss that Justfab clutch? It is adorable. Love the colors of this dress! The matching necklace is great, too! I used to do the same thing with my mother's catalogs! I'm really loving that dress it looks amazing and perfect with the necklace. I LOVE this dress! It looks so amazing on you and the necklace choice was perfect! I'm not sure whose look I like more! Adorable! And I want that clutch! Fun post!!! Love it! i got the leather jacket too and the draped moto jacket and shift. I always loved flipping through my mom's catalogs, too! I still look forward to getting them in the mail…even today (though now it's J.Crew, Bloomingdale's, etc.)! Love this color/dress on you 🙂 It goes perfect with your skin tone! WOW! You look stunning! Love this entire outfit and the dress is really gorgeous! Awesome pictures! Stunning dress! So funny that you and Jenn chose the same exact one! I love this dress on you and Jenn! Both different ways to style it but you look amazing! Loving orange this spring. Your clutch is too cute too. I love this look. The colour and detailing on the dress are adorable! I really like the shoe and necklace too. Super cute. This dress looks great on you! I love the mixture of bright orange and tweed-like material. Love that dress and color! I have been pleasantly surprised by Spiegel and even got my bridesmaid dresses from them. Love this dress, the cut and the color are so flattering! I love the color blocking and the matching necklace is perfect. 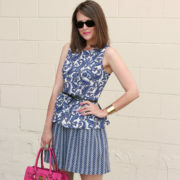 Enter J.Crew giftcard GIVEAWAY on my blog today! Oh so pretty! I love that necklace. Beautiful dress! I love your blog. You have great style. I am a new style blogger. Please share some tips on how do you get big brand names to approach you to showcase their items. totally in love w/ that necklace! !